Want to lift the front of your 2005-2014 Tacoma without the hassle? Our new Tacoma IFS Front 3” Strut Extension Lift is exactly what you need. This IFS Strut Extension Lift is a simple bolt-on kit, eliminating any need to disassemble your front struts. The strut extensions are constructed out of black anodized 6061-T6 aircraft grade billet aluminum and the mounting studs are made out of zinc-plated Class 12.9 alloy steel for superior strength. This kit was designed to give you a 3” lift in the front while keeping the stock suspension feel. Note: We recommend you purchase and install a Diff Drop Kit (part #300705-1-KIT) when installing this kit on a 4WD Tacoma. Want to lift the front and rear of your 2005-2014 Tacoma without the hassle? Our new Tacoma IFS Front & Rear 3” Strut Extension Lift is exactly what you need. This IFS Strut Extension Lift is a simple bolt-on kit, eliminating any need to disassemble your front struts. The strut extensions are constructed out of black anodized 6061-T6 aircraft grade billet aluminum and the mounting studs are made out of zinc-plated Class 12.9 alloy steel for superior strength. 2” rear add-a-leafs with anti-friction pads are also included. This kit was designed to give you a 3” lift in the front, level the truck, and eliminate the factory rake. Best of all, it keeps the stock suspension feel in the front suspension. Want to lift the front and rear of your 2005-2014 Tacoma without the hassle? Our new Tacoma IFS Complete Front & Rear 3” Strut Extension Lift is exactly what you need. This IFS Strut Extension Lift is a simple bolt-on kit, eliminating any need to disassemble your front struts. This kit includes strut extensions, a Tacoma diff drop kit, 2” rear add-a-leafs, and a driveline spacer kit. The strut extensions are constructed out of black anodized 6061-T6 aircraft grade billet aluminum and the mounting studs are made out of zinc-plated Class 12.9 alloy steel for superior strength. Our Tacoma/FJ Front Differential Drop Kit is made out of solid aircraft-grade 6061-T6 aluminum and zinc-plated Grade 8 hardware. The complete lift also includes our new Tacoma Driveline Spacer Kit. 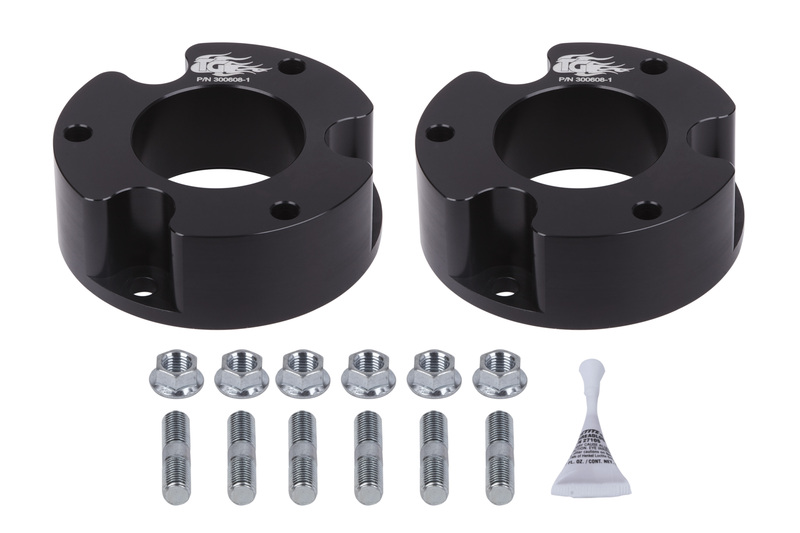 The Tacoma Driveline Spacer Kit is made out of 5/16” thick zinc-plated steel. Longer M10 mounting bolts are included in the driveline spacer kit. This kit was designed to give you a 3” lift in the front, level the truck, and eliminate the factory rake. Best of all, it keeps the stock suspension feel in the front suspension.